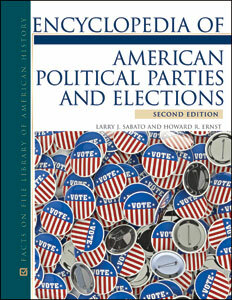 Encyclopedia of American Political Parties and Elections, Second Edition provides comprehensive coverage of the American election process and its political parties. A complete A-to-Z reference, this intelligent and objective guide covers the people, events, and terms involved in the electoral process. Coverage also includes the history of elections in the United States, focusing primarily on the presidential elections. Larry J. Sabato received his Ph.D. from Oxford University and currently teaches at the University of Virginia, where he is also director of the Center for Politics. An expert on American elections, he is the author of the widely used survey text American Government: Roots and Reform. Howard R. Ernst received his Ph.D. from the University of Virginia and currently teaches at the United States Naval Academy. He coedited Dangerous Democracy? : A Battle over Ballot Initiatives in America. He lives in Arnold, MD.